I have 3 dogs & live on 5.5 acres in the country. The dogs have limited access to the bush. Our rescue lab is 15 yrs old and does not go into the bush...just wanders around the barn. The other 2 dogs do run in the bush frequently throughout the day. Is it necessary for all 3 dogs to have heartworm testing? My son-in-law is a vet in Toronto & did get me Revolution to start early this year because it has been so warm. I started it on all 3 dogs the first of May. All 3 dogs had heartworm testing last year. You didn’t mention where you live, so I don’t know how serious of a problem heartworms are in your area. Your best option is to ask a local veterinarian what his or her recommendation would be. 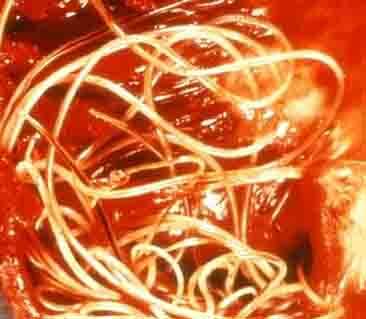 In places where heartworm disease is unlikely to be transmitted locally, many veterinarian are comfortable with decreased testing frequency, particularly in those patients that receive preventative on a regular basis. However, it is important to realize that if you don’t follow the manufacturer’s dosing and testing recommendations, their guarantee states that they will pay for heartworm treatment in the event of preventative failure is no longer in effect. Also keep in mind that your dogs’ needs might need to change if you travel to a heartworm endemic area with them. Join in and write your own page! It's easy to do. How? Simply click here to return to Heartworm.